7 top tips to designing your Leicestershire Kitchen. It’s the heart of the home, a place for family and friends to gather together and the space where some of the best memories can be made. All things to think about when designing a new kitchen. Whether you are a keen chef who loves making culinary magic, or you find it a great place to entertain guests in your home, it’s a room that should be attractive and welcoming, whatever your style. There are many stunning kinds of kitchen to go for and a whole range of colour schemes to suit the décor of your home. Whether you like the thought of rustic, modern, stylish and contemporary, vintage or totally chic, it’s somewhere you can design to your own personal taste, which should cater for your every need. When choosing the ideal kitchen, it’s also the practicalities that you need to think about as well as the style. So, when it comes to what to put where, here are seven top tips to designing your Leicestershire kitchen. Space – give yourself room to manoeuvre while you’re cooking and direct traffic away from where you’re working. Also, ensure plenty of room on either side of appliances such as the cooker, fridge or microwave so that you have somewhere to set things down – a landing space, if you like. Bin placement – it’s always good to have it near the door as it’s the most used bin in the house and also have it easily accessible to scrape vegetable peelings and leftovers into. Have the dishwasher and sink close to each other – for plumbing purposes and also once you’ve rinsed the plates, they’re not dripping all over the floor on the way to the dishwasher. Give yourself plenty of room between your worktops, so you have space to open drawers and cupboards and comfortably fill the dishwasher. 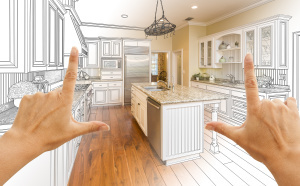 Consider the size of the appliances you have or would like – how will they fit into your kitchen design? Will they be too big or small? Plug sockets – ensure you have enough for all of your kitchen appliances. Lighting – what is your kitchen mainly to be used for? In the cooking areas give yourself plenty of light, but for entertaining areas, consider pendant lights and dimmer switches. When it comes to designing kitchens, this is something we are passionate about at Dewhirst and have been for over 50 years. When designing your kitchen, we believe it’s vital that not only does it reflect your taste and style, but it suits your lifestyle too. This way the heart of your home will be somewhere you’ll truly love for years to come. It’s also one of two rooms in the home that should be the most appealing for visitors and prospective buyers alike, if, of course, the day ever comes that you decide to move on. If you are thinking of designing your own kitchen, then come and have a chat with one of our experts today. We would love to discuss your ideas with you and help you find a way to achieve the kitchen of your dreams. And with so many styles and designs to choose from, we’re confident that you’ll discover a design that’s perfect for you and your family to enjoy for years to come.